The signal transducer and activator of transcription STAT1(M97935:9606) protein is a cytoplasmic latent transcription factor that becomes activated by various extracellular stimuli, including cytokines and growth factors that bind to specific cell surface receptors. The activation of STAT1(M97935:9606) in IFN-γ and IFN-α/β signaling pathways is largely mediated by phosphorylation of conserved tyrosine and serine residues in the C-terminal region. 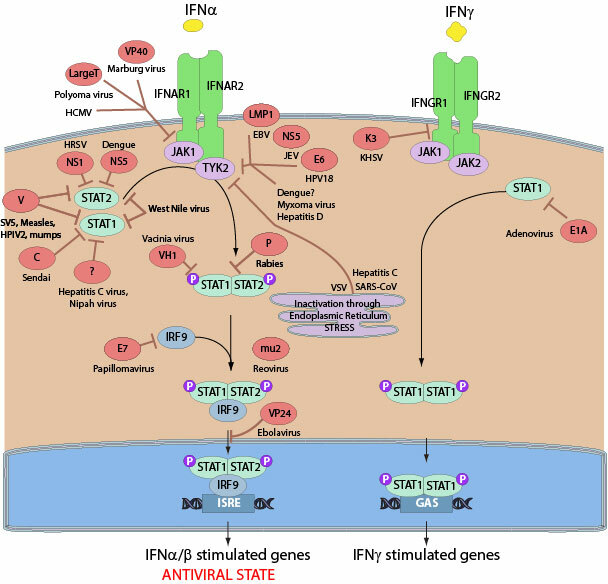 While IFN-γ induces STAT1(M97935:9606) homodimerization, IFN-α/β mainly stimulates heterodimerization of STAT1(M97935:9606) and STAT2(M97934:9606), both leading to STAT1(M97935:9606) activation and nuclear localization. Many viruses modulate the interferon mediated response by acting on STAT1(M97935:9606) using different strategies. The V(P11207) protein of simian virus 5 inhibits interferon signalling by targeting STAT1(M97935:9606) for proteasome-mediated degradation. Sendai virus C protein also physically associates with STAT1(M97935:9606) and send it to degradation. Vaccinia VH1(Q80HW5) phosphatase instead reverses STAT1(M97935:9606) activation by interacting with and dephosphorylating STAT1(M97935:9606).